My go-to going out makeup look feat. dewy skin, bold red lips and a touch of highlighter in less than 10 minutes flat. After what feels like a lifetime of relying on the exact same make-up routine, I’ve finally stepped up my beauty game in the quest for more dewy, flawless skin. 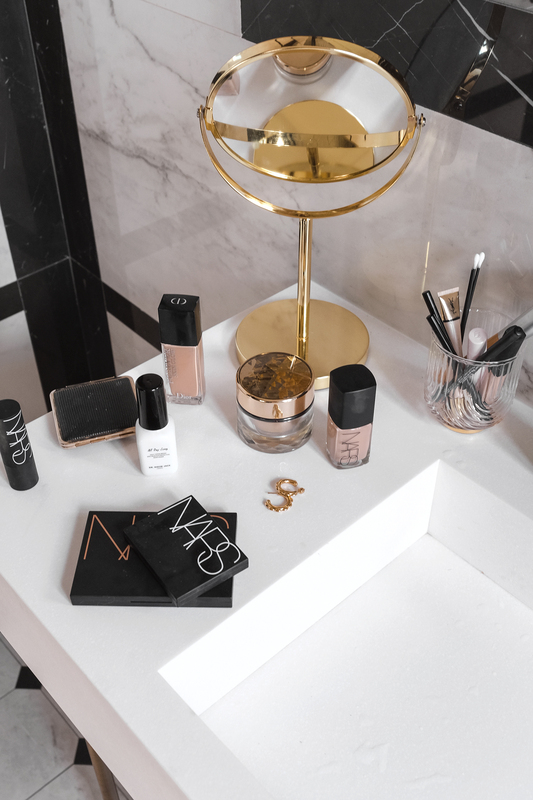 Although rather than spend half an hour in bathroom on a Friday night, I prefer to use a few reliable products that will not only make my skin glow but keep glowing all night long. They do stay it’s all about the base – and whoever they may be, is right. I like to use a heavier night cream before applying my makeup to really replenish the skin. At the moment I’m using Estee Lauder’s Re-Nutriv Ultimate Diamond Transformative cream. Then because I tend to find that my foundation after disappears throughout the course of the night (especially if I only apply a light layer) I actually double up on primers. I use Dr Brant Luminizer Primer Base Lumiere to create an even skintone, followed by MAC Strobe cream which adds a subtle glow-y boost underneath your foundation. I’ve been using Dior foundation for almost as long as I can remember. And although it requires more of an initial investment than some of the more budget-friendly options out there, I actually find because the coverage is so amazing it lasts me better in the long run. I usually end up replacing the bottle every 7-8 months which I think is pretty good bang for your buck. Dior Beauty actually just released a new foundation, the Dior Forever Skin Glow and I love it. It leaves a super dewy, natural complexion, coverage is amazing and most importantly for everyday use, it includes SPF. Okay that was quite a ramble but honestly who doesn’t love faking a flawless complexion? Next up I use NARS Radiant Creamy Concealer under my eyes and anywhere else I need extra coverage – this product is pretty heavy duty so less is definitely more. 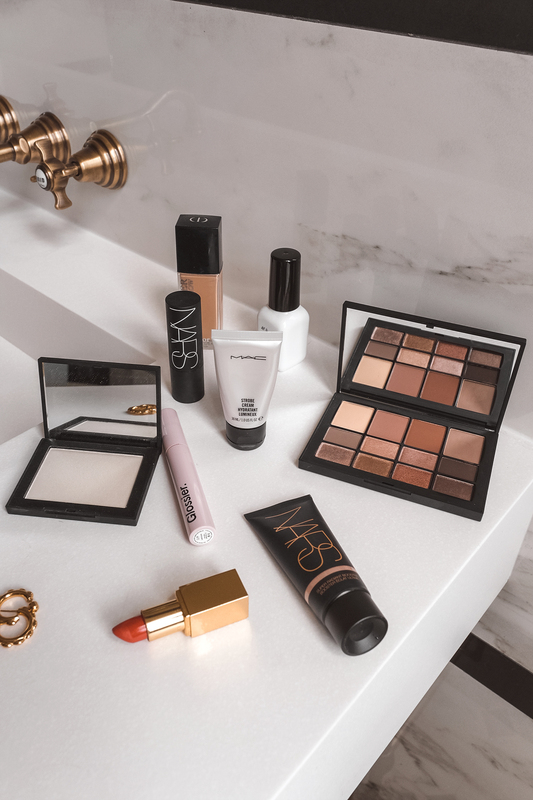 Once I feel like I’ve covered up any redness or tired eyes (while still keeping a super natural complexion of course) I apply NARS Skin Deep Eye Palette to my lids to make my eyes pop ever so subtly. I’m pretty late to the illuminator and highlighter game, and I have no idea why I ever hesitated adding a shimmering boost to help define the jaw line. At the moment I’m using NARS Super Radiant Booster as a kind of bronze and highlighter in one to both define the fast and give that I-just-came-back-from-holiday glow. If I was going to single out one beauty product I couldn’t do without, it would definitely be a brow gel or pencil. On the days I don’t wear makeup, then I just apply SPF and do my brows. I alternate between Glossier Boy Brow in Blonde which is great for full, bushy brows and Dior Brow Styler in Blonde which is the best tool for creating a natural, feathery shape. Then I add a quick sweep of mascara with Glossier Lash Stick which has become a firm favourite because it defines and boots the lashes sans any gross clumping. And finally, I finish off with a bold red lip, which is my preferred ‘going out’ beauty look, especially when paired with a relatively natural base and eyes. A red lip is also my favourite secret weapon when I don’t want to feel overdressed. When in doubt, dress down, but add a bold red lip. I’ve had a few favourites over the years, although right now I love Aerin Beauty x Johanna Ortiz Lipstick in Cali Aji and Kosas Weightless Lip Colour in Thrillest.